I don't know about you but I am on a life long journey to try new recipes every chance I get. Christmas dinner at my house is a traditional occurrence every year. Although I have my dishes my family will not let me do without I am always looking for a new and welcome edition to our menu. Every holiday we have any where from around 20 or so people give or take a few at any given time coming in and out of the house. As you can imagine there is a huge range of likes and dislikes when it comes to food. The best part of having a small army to feed is the opportunity to chose a new dish here and there but always sticking with the big hit items that everyone expects to see on my dinner serving table. 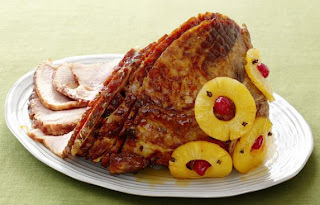 I am making the ham ham pictured above for Christmas eve and Christmas day along with Turkey and all the trimmings. I am so excited to find something new to try and get everyone's feedback on. I can't wait to pick one out. I am still looking for ideas so if you have any recipes ideas for me feel free to leave me a message by clicking on the "No Comment" text at the end of this post. Let me know what you are making. Thanks happy cooking.